This week's European Gas Storage figures are out. I decided to put the figures in the form used by the EIA. Keep in mind that European Union storage is about half that of the US. Working gas in storage was 534 Bcf as of Monday, March 9, 2009, according to estimates. This represents a net decline of 61 Bcf from the previous week. Stocks were 280 Bcf lower than last year at this time. Switching back to metric. Stocks are now approximately 8 bcm below last year (last week was 7.2 bcm lower than the same week last year - get the picture here...). European storage is now down to about 30% as compared to about 46% this time last year. Storage continues to decline at a rate of around 100 mcm/day faster than last year and has done so ever since the Russian production collapse. Storage in France is now below 20%. The government responded by accusing the Conservatives of "rumour mongering". Nasty talk. Maybe Gordon Brown will start locking opposition politicians up if they don't agree to keep quiet. One other interesting factor is that the UK almost ran itself into a gas emergency partially due to the mainland Europe Interconnector running in export mode virtually throughout the winter. Had the UK not exported gas then mainland Europe storage would be even lower than it is now. In particular French storage (already below 20%) would likely be in an even worse state than it actually is. Also Gas Transmission Europe has just launched a study to report at lightning speed (by normal standards) by mid-year on how to improve the "reverse flow" network capability - ie what the hell do we do if there's no Russian Gas. reverse flow capacity needed in Europe. The work will be carried out under the GTE+ structure 1 . ...Jacques Laurelut, GTE President, said: “The recent gas crisis has proved the importance of flow reversal in mitigating the consequences of supply disruption. Without doubt, the resilience of the European gas network needs to be further boosted to ensure a better response in possible emergency situations." Reverse flow what? Nat gas derivatives? I think they are looking at reverse flow from LNG imports + anything extra that Norway can provide. With 5 gas pipelines going directly from Norway to continental Europe there is little need to have any of this flow via UK. But the UK has built / is building over capacity in LNG import facilities - just like everyone else. Although if Russian gas supply is seriously insufficient then I would say (from a mainland Europe standpoint) there is every need to have any available supply come by every available route. And that would include some UK LNG imports + some UK/Norway pipeline imports being used to feed the Bacton Interconnector I guess. Undertow - my partial understanding of the situation is this. The market expects / expected nat gas prices to fall since Russian gas price is linked to oil + a delay. This seems like a license to print money . So gas storage has been sold off at high price with expectation that it will be filled again with cheap gas this Summer. This discounts the possibility that the Russians may at some time change the rules of the game. At some point, Europe will struggle to fill storage in summer - though I'm not sure that will happen this summer - but when this does happen, seasonal price differentials will disappear. The political perspective from the House of Commons is fascinating. At least now the opposition is asking the right questions - and this lays Government credibility on the line. So gas storage has been sold off at high price with expectation that it will be filled again with cheap gas this Summer. Yes that's the official line anyway but as various European politicians have made occasional reference to their own levels of storage as a serious cause for concern - it seems unlikely to me. In fact if it was the case that, in the middle of winter, during a crisis with Russia/Ukraine which could blow up again at any time, with storage already heavily drained, that European Gas companies are choosing to run on empty thus forcing Gazprom into a crisis then the decision makers should be forcibly removed from post right now. In any case Gazprom's own projected production for this year is about 500bcm. As production YTD seems to be running at about that level, Gazprom is clearly not forecasting an increase in production later this year. So unless Russian internal demand collapses spectacularly I just don't see where this expected "cheap gas later" is going to come from. Also, and I may be wrong on this but, as far as I can see, most of the missing Russian imports were actually pre-contracted at the higher price - so the option of choosing not to purchase the gas should not even be there even if they wanted to - well not without Russian agreement anyway. But I admit that's a bit I'm not absolutely sure about. whoa ! isn't gas fungible ? if a molecule of gas is old, or new, how does that old molecule know to be burned in preference to a new molecule ? so it is possible to maintain a ledger showing gas volume x price, but how is that in any way meaningful ? if gas in storage is depleted to a low pressure, there is an additional overhead(fuel) required to compress the gas to a higher pressure. I would bet that a large part of the difficulty in understanding why EU gas prices are too cheap would be the temporary excess of gas in N America due to still-producing shale wells drilled in the good times, now rapidly depleting an not being replaced. Must displace a significant amount of LNG, making it available to EU for import. That's not going to last much longer, since all those rigs are laid down. 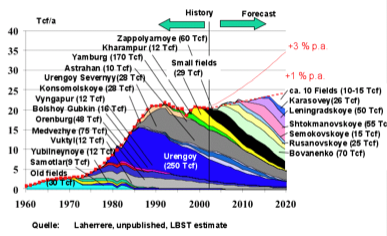 The late Dr Samsam Bakhtiari expected Peak Gas to occur around 2008/2009 (far earlier than most predicted) mainly due to the decline of Russian supergiant fields. And, to top it all off, Matt Simmons is currently going round the world telling audiences that "Europe is toast - cold toast", and that we've been "hung out to dry"
but would like to see an updated version. I agree that decline in Urengoy and Yamburg has to be a worry - but this has to be analysed more professionally than portrayed by Simmons slide. Looks like an outdated wish-list. Sorry, maybe I'm just being overly cynical tonight... but yes, I'd also like to see an updated version of the chart posted. Maybe the new fields could be re-inserted but starting about 2012? Note reserves values are all higher than Jean's. What is the total of all the fields you listed above? I've not added up yet. Need to cross check their views on fields we know about from OECD. It will be interesting to start summing from bottom to see how far up the list you get to get an Urengoy. Another point I would note here is that Bakhtiari considered Russian gas claims for undeveloped fields to be grossly exaggerated. Euan, do you know that according to Russian law, information about total reserves of oil in Russia and in large "strategic" oil fields is considered state secret. Because of it, foreign top managers of oil companies have problems with access to some data of their own companies. Curiously, natural gas is not covered under this law. I think, it is because Gazprom holds all information anyway, and the company can control what data can become public. Either way, we know nothing about true amounts of oil and gas in Russia. And those who know can't speak. I like your model, but we cannot deny the possibility of positive surprises. Every year the Ministry of Natural Resources take a few oil/gas/ore licenses out of the black box and auction them off. What is in that black box is everybody's guess. Also, it's hard to distinguish an oil field discovered last year and one discovered in Soviet times and put on hold. And in Soviet times we employeed pretty unique techniques of exploration like seismic imaging with nuclear blasts (total 39 explosions for that purpose). 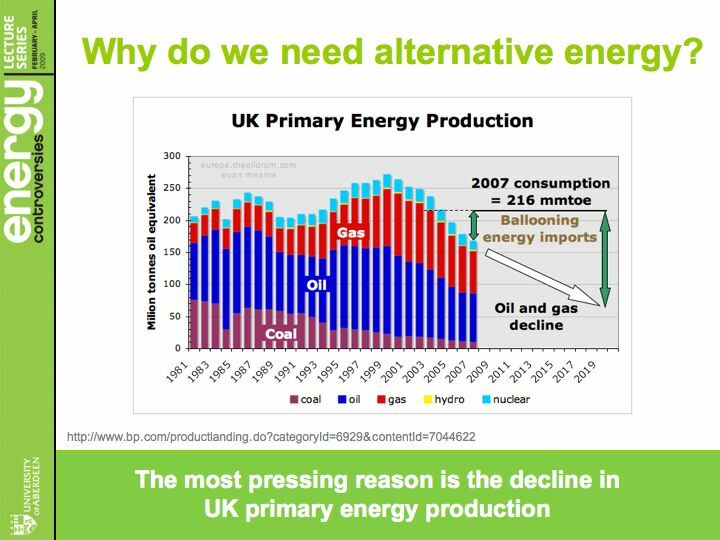 Is it possible that the companies that would build and profit from the extra storage capacity, have looked at the prospects for the uk actually getting the gas and decided that they will not be able to fill any capacity that they actually build, so have not bothered to build it? There may be something to what you say. If companies are uncertain they can source cheap summer gas for the duration of capital pay back they may be reluctant to commit. Despite the gas situation, the uk still seems to be obsessed with new gas generation projects. Referred to in the Sunday Mail something along the lines as "the second round of dash for gas". For the past decade we have buried our heads in the sand, hoping that North Sea oil and gas — now in terminal decline — and a sound industry, constructed by the Central Electricity Generating Board in its heyday before privatisation, would meet our needs. The awful reality that we will lose a third of our generating capacity over the next decade has only just begun to dawn — and it has to be replaced. The market will only provide new gas-fired stations or, if they are very heavily subsidised, offshore wind generators. There are serious problems of security of supply with both these options. So, with a complete volte face, the prime minister now wants as much nuclear power as possible. 50 mmtoe is about one third of our energy gap by 2020. Maybe Gordon was listening in. Event was filmed so links to video will eventually be posted. Without gas peak generation it might be hard to balance wind's fluctuation. I understand PLWR nukes can only throttle back 5% an hour, not 100% shutoff in minutes like combined cycle gas. Correct me if I'm wrong. That's correct. Best to have energy and worry about balancing and grid stability later IMO. We will have LNG imports for a while at least, that can be used to help balance the grid - and heat homes - and fuel industry. UK nat gas is now 30p / therm compared with 55p a year ago. I can't help feeling that this is a highly misleading price signal. Does the UK used NG for mainly base-load electricity rather than just peaking( ie capacity factor >0.5) whereas in US gas is used mainly for peaking( capacity factor 0.2)? it should be possible to push these ahead to get them under construction as a recession fighting measure. Building say 4,000MW-8,000MW capacity a year is going to add up to a lot of NG saved. Since NG accounts for approx 40GWa, that could be a 25-50% saving in NG used for electricity within 10 years. Generally been the case in recent years. However during the coldest part of this winter with gas storage at worrying levels, we ramped up our coal stations to maximum and used gas to supplement peak demand. We also ramped up our ageing nuclear stations to a level not seen in quite some time. We've now returned (for the moment), as you observe, to using gas as the primary supply. I always appreciate the technical depth of your posts and I very much like the visual impact of your slide. However, I remember a very long series of posts and a long (seemingly solid) analysis of nuclear suggested an ERoEI of about 100:1 (I vaguely remember that this analysis was about nuclear in Australia?? - don't remember). You have a 5:1 (e) for the nuclear EROEI on your chart. Could you comment on the difference? Is it because this is an old design with poor EROEI compared to other (presumably newer) nuke plants? How about the EROEI of Thorium reactors? 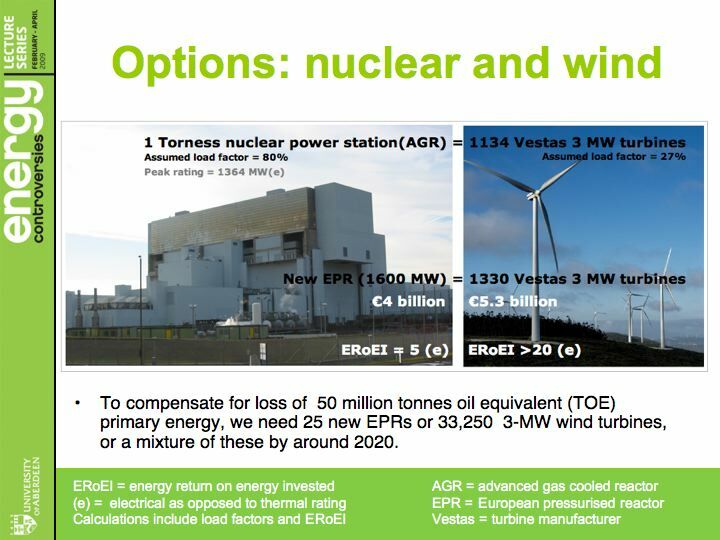 A much higher EROEI for nuclear would presumably provide a better incentive for nuclear over wind (assuming the capital costs are within reach). As ever, the EROEI is very dependent on the built-in assumptions, eg gaseous diffusion or centrifuge for enrichment of U-235, energy costs of decommissioning, etc. The EROEI value derived at the above link is 93:1. Lenzen I believe is one of the foremost workers in the net energy field. ERoEI is not the only property to consider. We have stable base load on the one hand and flimsy, intermittent supply on the other. I have seen it illustrated that peak investment in the uk's electrical infrastructure was close to 1964. This was also the year of peak oil discovery I believe. I cannot see why they should be connected, just a coincidence most probably. Here is a document that shows when uk power plants were constructed. The big 2000MW plants are mostly 60's era. I find it strange that the media seems to think that only off-shore wind farm projects are being considered. Submissions are 2:1 for on-shore and approvals in last 2 years about 50% onshore/50% off-shore. "serious problems of security of supply with both these options." ?? What are the security of supply issues? Russia is going to cut off wind?? I know you didn't write this just curious about attitudes in UK to wind power, seem to be different to rest of EU or to US. I'm guessing it probably refers to the fact that on one of the coldest days of the year this winter, total UK wide wind generation dropped to just a few percent of nameplate capacity for a day or two. Far longer than could be covered with pumped hydro storage. I guess that means reliability rather than security. If gas is cut off by a political action( security) could be off for months or years rather than days. Interruptions due to low wind( or an explosion at a NG terminal, or a nuclear shut down or a workers strike can be met by power shedding, peak NG etc, not desirable but OK for a few days, but if interruption was months or years could destroy industry and use up all NG reserves. I thought a grid connections were planned or built from UK to Norway and France to help with "local wind variability"
Sorry I'm getting increasingly cynical - and frightened if the truth be known. However I actually think frightening the world's population with the truth is exactly what we require right now. Glory seeking, stupid politicians (and their economic "masters") should go frak themselves and get off the stage (not that that is likely to happen while they still have any say). But yes, I'd far prefer intermittent wind to permanent nothing. Your concerns are with reduced NG availability and inadequate winter storage. The UK is using NG to generate 40GWa electrical power(26GW as CCGT),I am guessing at a capacity factor of 0.5. If an additional 60GW wind capacity was built, especially if 50% was in Scotland and on Orkney's and Outer Hebrides, covering a large geographical area, we know from Graham Sinden's work that during peak power demand times, dispersed wind power in UK would provide >40% capacity( 24GW) >50% of the time and >10%capacity(6GW) >90% of the time. So if NG is used mainly in these peak times, savings would be about 25GW or 60% of NG used for power. Thus NG could operate on 0.2 capacity factor saving 60% of the NG used for power production. The least efficient peaking plants would only need to be used 10% of the peak period times(3-5% total time). Since there are also aging coal plants that can only be used at a low capacity (high demand periods), these could be used only in low wind periods (for example 3 day winter high pressure system). This would require X5 the 2008 wind build rate ( 6GWc/year) over a 10year period. A population and an economy can live with rolling blackouts/NG rationing a few days every five years if we had to use more than 25%wind energy because new nuclear could not be built in time. You may be confusing technical solutions with political ones. We used to have a single body in control of both generation and the 400kV/275kV transmission infrastructure, called the GEGB. The responsibility of the CEGB was to keep Britain's lights on and they did much good early work on wind power and fluidised bed coal technology. The government has since done what governments do best, f**ked everything up with a rats nest of privitisation and regulation. As I understand it, they devised a clever piece of regulation called NETA, which discriminated against just the technology the government was trying to promote: wind! Put simply, the generating companies bid for short contracts (I think it was done at half hourly intervals) and if they failed to meet their obligation, they were penalised. Wind was relatively un-predictable, making such bidding risky and potentially costly. This may now be resolved, but my point is, as it usually is, technical feasibility is only a small part of a a big problem. The big problem is the idiots we have as policy makers. Has there been any progress on harvesting clathrates? We had better burn them before they are released into the atmosphere. Given that the vast majority of the clathrates are widely dispersed in unstable marine sediment banks, I find it hard to see how any technology could harvest them economically, and without causing massive methane releases direct the atmosphere. I sincerely hope they remain exactly where they are. Yep, this is a *#$@^, rotten mess and Samsam's early predictions were widely unappreciated by Euro-politicians. Instead, they preferred to dopamine-thrill themselves by deeply-sitting on their thumbs vs moving to mitigation. IMO, I would expect Putin to have some kind of similar natgas announcements precisely timed for maximal effect when contracts start coming up for negotiation. This can help him leverage Gazprom's marginal cubic meter to greater profitable heights. Let's say he wants Russia to quickly build, then stockpile a 5-year internal supply of natgas-sourced N-products [ammonia & urea] to enhance their national food security. Lots of other industrial chems could also be stockpiled too. It would only make common sense to do this if their natgas is downslope trending. And Putin said just last week that Russia has enough oil and gas to meet it's own and export demand for 100 years! I seem to recall former Russian PM Mikhail Kasyanov, said in a tv interview a year or so ago (CNN International I think but it might have been Bloomberg) when he tried to stand for the post of President, that the biggest challenge ahead was peak fossil fuels and that western Europe seemed to have no idea of the urgency of the problem. If elected he planned to work with western Europe implying Putin/Medvedev didn't. I never did find a copy of the video online. He was disqualified from running for office just after he made that statement IIRC. Kasyanov did everything he could to be disqualified to save his face. Don't read too much into it. Here are some more press reports on Gazprom from the last couple of months. Russian energy giant Gazprom might this year have to cut production with up to ten percent. Exports drop and the company’s revenues might shrink with as much as 26 percent. Experts now say that Gazprom might have to make dramatic cuts in its investment program. Figures for January 2009 show that Gazprom produced 13,9 percent less than in January 2008. The company now itself admits that production figures for 2009 might be 7-10 percent lower than in 2008. That means that the company’s production might drop below 500 billion cubic meters. As newspaper Vedomosti reports, the Gazprom estimates show a 2009 production of 511-495 billion cubic meters. ...The drop in production and exports come amid the company’s intention to strongly boost results. Last year, company CEO Aleksey Miller maintained that production will amount to 563 billion cubic meters in 2008 and then 570 billion cubic meters in 2010, 610-615 in 2015 and 650-670 in 2020. Those goals now seem unrealistic. Sofia. Gazprom has published reports on its production volumes, described by the media in the country as ‘contradictory’. The Russian energy monopolist has been trying to conceal a failure to cover the projected production volumes of natural gas, Nezavisimaya Gazeta reads. The recent slump in natural gas consumption has forced Gazprom to slash production by 13% for a second month running, a record output cut over the past decade. Analysts estimate that a 10% cut in Gazprom's production reduces the country's GDP by 0.3%-0.5%. CDU TEK, the Energy Ministry's central dispatch unit in Moscow, has calculated that Gazprom's average daily gas production in mid-February was down 13.3% year-on-year. 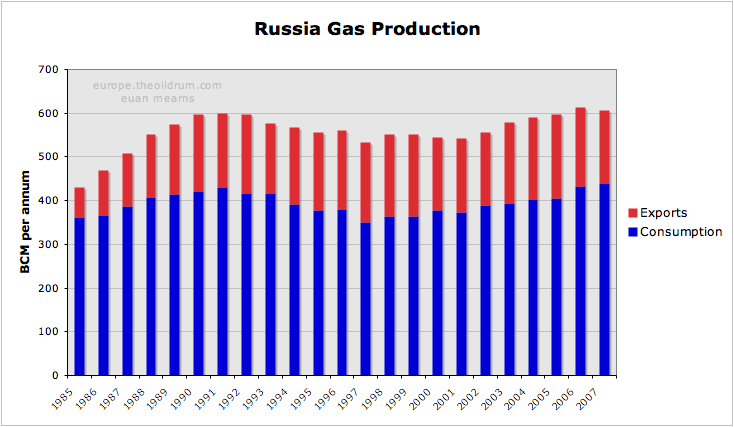 Natural gas production has decreased by 9.9% on average across Russia. In January, Gazprom lost 13.7% in output because of its conflict with Ukraine. Poland's gas supplies remain lower than contracted, but Gazprom is demanding a new agreement. Despite the fact that Gazprom has not been meeting its contracted supply commitments to Poland, the Russian gas monopoly has demanded that the Polish government renegotiate its gas supply agreement with Moscow. Only after the agreement has been renegotiated will gas supplies via the Yamal-Europe pipeline return to pre-January levels, Gazprom officials informed Polish gas firm PGNiG. As of last week, Poland was receiving only 75 percent of the gas previously agreed upon with Gazprom. This has been the case since the Russia-Ukraine gas crisis was resolved last month and the government warned last week that this could continue through April 30. In theory, Gazprom should be one of the world's premier blue-chip companies. It owns the largest gas reserves in the world, employs thousands of highly qualified professionals, and most of Europe is its captive customer. But in reality, it appears that the company is coming apart at the seams. Gazprom's 2009 revenue might decrease by some $20 billion due to dropping gas prices caused by the global recession, and it has asked the Russian government and foreign investors for help. The company will have to cut back on its long overdue investment program to develop new gas fields, according to media reports over the last six months. This curtailment is a serious blow because Gazprom desperately needs to replenish its diminishing reserves. ...Instead of investing in developing new gas fields and infrastructure, CEO Alexei Miller, working hand-in-hand with the Kremlin, poured billions of dollars into senseless projects -- buying football teams, building a skyscraper, gambling that Central Asian gas will make up for Russia's lagging production and engaging in theatrical, highly political conflicts with Ukraine. I keep wondering whether the annual theatricals with Ukraine are a smoke screen to conceal a lack of capacity to meet peak winter demand. If this is the case Europe is well and truly screwed. Typically in March for the last few years Gazprom production has been running at about 1650 mcm/day or an annual equivalent of approximately 600 bcm, according to production snapshots I've been able to find with searches. How much gas do all the other companies produce? Every other producer other than Gazprom has shown production up on last year. However there were several press reports of a "behind closed doors" meeting Gazprom had with the other producers last week, the outcome of which reportedly is that other producers are to be forced, kicking and screaming to reduce production even though they all seem to have customers for everything they currently produce. Ah - so is Gazprom playing swing producer? I also wonder if Gazprom's production has really dropped quite as low as the published figures and if some more actual production could be being diverted to storage (which the Russians claim is full to the brim despite it being winter). There doesn't seem to be any available source with reliable Russian storage data that I can find. Gazprom has about 60bcm of storage I believe. It's interesting that if you look at say a 5% decline rate it would be possible to cover this up with storage games for a few years - or possibly to just about now? IMHO, the problems with Ukraine were not a smoke screen to conceal lack of capacity. In the past dogma would have meant that the USSR countries were supplied with gas at very low prices that did not reflect commercial realities. Nowadays the leadership is aware that they cannot afford to give away their resources, especially to states that may be openly hostile, when those resources are diminishing. Note, the Ukraine spat is not really over since Ukraine cannot afford to import any gas and the economy is collapsing. So we ask ourselves, what does Ukraine have that Russia needs? Firstly Russia does not want nuclear missiles on its borders (similar to USA:-) since they are blatantly a weapon to allow a first strike to be successful. The warm water port of Sebastopol is a bargaining chip but in a warming world grows less valuable. And again the critical point about Euan's slide is the thin margin of supply in excess of consumption. When consumption is high relative to production, small production declines and small increases in consumption cause huge declines in net exports. For example, based on 2006 EIA numbers, a 5% decline in Russian production combined with a 5% increase in consumption would result in about a 30% decline in net natural gas exports. As I understand, Poland wants Gazprom to assume obligations of RosUkrEnergo. Gazprom makes a surprised face and refuses. RosUkrEnergo says that Naftogaz confiscated all of its gas in Ukrainian gas storages. Naftogaz makes a surprised face and says they knew no RosUkrEnergo. And the truth? None. No truth, only sides. That's true of one pipeline. The story I linked explicitly referred to another pipeline which doesn't pass through Ukraine - The Yamal-Europe pipeline. Thus RosUkrEnergo/Naftogaz games don't come into it in this case so why the reduction? Was there really a reduction? As I understand it, Gazprom supplies contracted gas. Poland says "But you can supply more." Gazprom answers: "Should we?" Well Poland clearly stated that it was Gazprom pre-contracted gas not being supplied. And even if you call the Polish liars, why on earth shouldn't Gazprom offer to supply more if they had the capability and Poland needed it? Doesn't enhance their reputation as a reliable gas supplier does it? Poland clearly stated that since Gazprom holds a share in RosUkrEnergo, it should fulfil RUE's obligations. Poland just sums Gazprom's and RUE's contracts and calls it all "Gazprom". It's not lie it's just word games, popular in our part of the world. "Doesn't enhance their reputation as a reliable gas supplier does it?" - I think, Gazprom doesn't care. "If you don't like it, shop elsewhere" is a motto of the post-peak world. Only after the agreement has been renegotiated will gas supplies via the Yamal-Europe pipeline return to pre-January levels, Gazprom officials informed Polish gas firm PGNiG. I think, Gazprom doesn't care. "If you don't like it, shop elsewhere" is a motto of the post-peak world. It seems most of the political attention is focused on supply, instead of alleviating the waste in demand. The UK does have an aggressive new building energy efficiency program, but what is planned for the currently built environment? In proportion to total gas consumption, Europe has approx 1/4 the storage capacity per unit consumed as the US. Storage may therefore be used differently in Europe than it is in the US, since its a more precious asset. 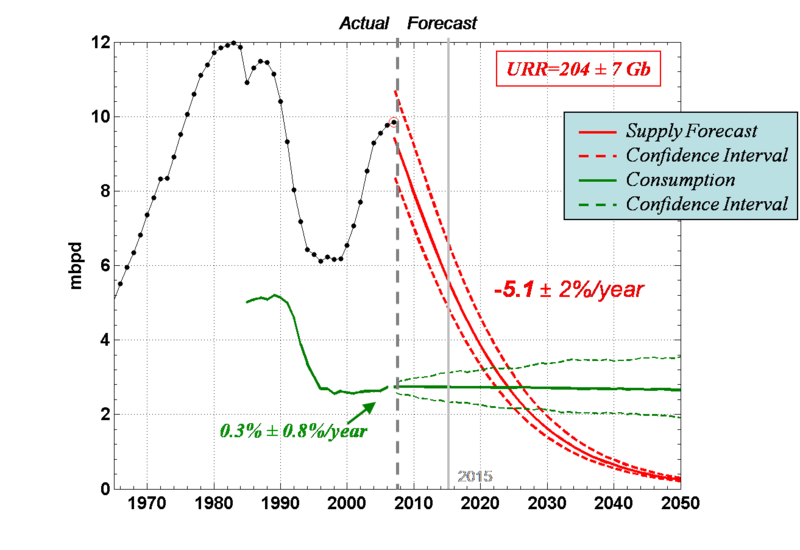 To look at storage balances and extrapolate a threat to supply is a huge mistake. Over the last few years significantly more flowing gas capacity has been added to the UK, simultaneously piped into Europe, from Norway. 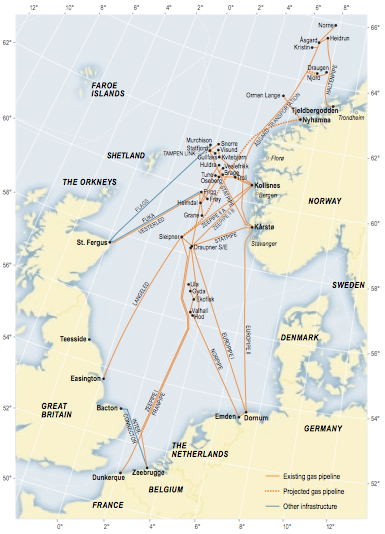 This permits Norway to flexibly move gas from the UK to Europe in response to price signals. It also decreases the need for and importance of operational storage in the UK, so long as UK producers are happy paying Continental prices for gas. Continental long-term gas prices are still largely linked to oil price on a time lag basis. This significantly distorts the price of gas and delinks it from demand. The great purge in storage inventories during the late winter may be more likely attributed to this one cause than anything else described here. Why would a utility hold gas in storage that was purchased during days of $140/bbl oil carry the gas over to next year, when oil prices have fallen by two-thirds and look set to stay there through next winter? They would post massive losses and may lose regulatory linkage on price recovery. Also ignored here is the flexibility provided to buyers in the long term gas contracts. Within ranges over periods of time, buyers can increase and decrease their consumption, providing a measure of storage capacity supplied by producers. Therefore it is very difficult to infer macro effects from pipeline flows without considering price signals and operational needs of consumers. The fact is that Europe is massively oversupplied at this point, with industrial demand down by massive amounts due to the recession. Producers will be feeling the crunch with lower prices programmed into the price formulas (following oil prices down), and low to nil demand for spot gas - forcing them into max production to keep revenue levels higher to maintain exploration. To make matters worse more LNG will become available on the market as Asia lets go of excess volumes due to demand destruction in that market. This sets up significant gas-on-gas competition between traditional pipeline gas and LNG during the summer fill season. So, from my perspective, there is no reason to be concerned about shortages this year. Additionally you're so called "free market" brought the UK to within hours of calling a Gas Balancing Alert (and being forced to ration supply) this winter. And perhaps you missed the millions of Europeans left to freeze a couple of months ago. A UK government minister recently responded to being questioned on how he could be sure of the security of the future UK gas supply with this astonishing answer: "It will be there because the gas companies have a legal duty to provide it." So that's ok then! To put things into some perspective, Gazprom's current reported annual production drop is greater than that during the fall of the Soviet Union. ... a gas balancing alert only triggers procedures for National Grid to directly procure supplies, not turn off the gas to granny (which they don't control in any extent.. the local utilities do that) - see http://www.nationalgrid.com/NR/rdonlyres/312CC783-1814-40EC-A1D3-79CBE31.... In any event non-critical industrial consumers would get shut first. But if you're a skeptic of the free market then there's no debate to be had! The question that you should focus on is whether a free market actually exists in the UK, with a near-monopoly on supply and the ability to meter it in response to relative price on the continent. So I take it you totally discount fears that Russia is suffering terminal decline (Bakhtiari, Simmons) and won't have enough gas to sell to the "market" at any price? Bakhtiari lost his freedom and possibly his life for providing his analysis. It's perhaps just a co-incidence but the Iranians didn't seem to have a problem with him talking even about even their own fields but perhaps his mistake was to provide detailed analysis of the future for Gazprom. I do wonder if that might have been the step too far. As far as the UK's supply goes, Norway is the big player. Russian supply to Europe certainly plays an indrect role as it can increase the price required to bring gas back to the UK that would have been sold on the Continent by Norway, but that becomes a price not supply issue (unless you don't believe in the market...). I refer back to Euan's post that contained the graph by Laherrere... I can't figure out how to insert it again, but it's the one that you subsequently edited. It is my understanding and belief that Gazprom will continue to invest upstream. Again I understand and believe that it is not so much about "E" (exploration) than it is "P" (production) - drilling wells and building gathering processing and pipeline systems. Gazprom had planned over $20 billion in capex plus other investments (but this figure is under review). In addition to significant demand destruction in Europe, there has been significant demand destruction in Russia, which increases supply available for export without requiring new production. This might provide a window of opportunity to slow down the spending to make it through the credit crunch. As Euan pointed out, that chart is several years old. I invite you to type in the names of the future fields listed into google and check latest estimates of earliest possible start dates and peak production dates then compare with the chart. If someone can come up with a revised chart that uses latest available data and still shows increasing supply going forward then I will be delighted. Just curious: do you believe in worldwide peak oil and gas and if so roughly what timescales do you believe these will occur in? And as to your comment about "trenchcoat-clad men wielding umbrellas"
My participation as a guest speaker at 'ASPO' conferences began with the marvelous 'Historical Premiere' at Uppsala University (Sweden) in May 2002, and it all came to a rather bitter end in March 2007 at the Florence Convegno (in Italy) -- from which I was very lucky to get away with my life. This whole concept is totally outdated and flawed. Do you know what percentage of gas can be cut by disconnecting industrial consumers? We have little heavy industry left to suspend. If you send any UK workforce home nowadays, they will simply consume gigawatts watching TV/making drinks. It's ok, we've got that one covered. We just shut off the gas to all the hospitals - unlikely the patients will all go home and step in their power-showers :-( And that's what almost happened in 2006. Some hospitals were given 4 hours notice of impending disconnection of gas supply even though, in the end, it wasn't needed. Hi Snook, welcome to TOD. That's from one of my comments up the thread. I agree that we are awash with gas and oil, but the worry is that the price signal this sends is deceptive in the short/middle term and the longer term. Major new Russian projects may get delayed - Shtockman will be a bench mark there. I don't see Statoil and Total committing to this at current prices. N American gas production is built upon drilling, that is in sharp decline. And lower energy prices will promote demand and help economic recovery. So I think we are headed for a very volatile situation where under investment today leads to supply shortfalls tomorrow at a time demand is rising. Noting that Norwegian gas production will likely start to fall in the not too distant future. Thats a scary graph especially given the alternatives are barely visible at that scale. With conversion and transmission losses, about 1/3 (possibly 2/3) of the primary energy from fossil fuels doesn't go towards doing anything useful. If the UK can scale up its non fossil electricity supplies specifically wind and nuclear it should be possible to get 20GW of each up and running by 2020, a rapid take up of electric transport due to short commute distances and high fuel duty will allow a greater share of nuclear power into the grid due to overnight charging. As you showed in your previous post http://europe.theoildrum.com/node/5178 CHP systems can deliver 3 times as much useful energy to society as conventional centralised power plants. For maximum efficiency the UK will need to be able to manage nukes, CHP and wind power in a grid, which could prove difficult but offers huge oppotunities for pumped hydro storage using HVDC to load centres and making use of demand side management. The UK also still has some large shipbuilding capacity it would be good if (after having missed the boat on wind power) it could become a leader in the manufacture of marine renewables, specifically tidal current turbines. I once worked for a very large multi-national oil industry company. We had engineers coming out of our ears who could design (and would love to have done) and build wind, wave, tidal projects and we had the ability to build most of the hardware. Why didn't we? - No "return" in the free market. Far more money in Thunder Horse (or Blunder Hearse as it was affectionately known). But yes we can still at least try something but this sleepwalking has to end right now. The Original Name was Crazy Horse for Neil Young and Crazy Horse. Yeh, I know about the previous name (renamed in Feb 2002) but BP claimed it was named after the native american leader. In June this year, BP regional president Bob Malone headed a delegation to meet Crazy Horse's descendants at the Rosebud Reservation. The purpose of the visit was to bring to a final close issues related to the renaming of the company's Gulf of Mexico field from Crazy Horse to Thunder Horse. "BP named our new offshore field 'Crazy Horse" out of respect for the Lakota's great spiritual leader," comments Malone. "But after learning the Crazy Horse family objected to such usage of the name, we renamed the field Thunder Horse. The trip was to formally apologize to the Crazy Horse family and bring closure to the issue." My friend from college named all of his prospects after southern rock bands, nothing to do with Crazy Horse except as a derivative of Neil Young's band name. That is good to hear that his prospect was not the blunder as he is one smart guy. Err but Neil Young is Canadian and Crazy Horse formed in San Francisco. "I hope Neil Young will remember, southern man dont need him around"
Remember its useful energy not millions barrels oil equivalent, electricity from wind 1GWa is about the same as hydro and doubling every 2 years, so will be a significant part of electricity production. "(after having missed the boat on wind power)"
History is full of examples of later adopters catching up on technology,( Japan cars, photo-copiers; France later than UK in Nuclear, but no oil and gas). The UK has one really really big advantage over Denmark, Germany LOTS of great HIGH QUALITY wind resources, both on land in remote regions( less people) and off-shore very large coast line that Vikings would fight for. The many aging nuclear and coal plants needing replacement, so similar capital cost. UK wind peak power matches electricity demand, UK also has great sites for pumped storage, and lots of rain. UK's warmer climate is an advantage for electric heat pumps replacing NG heat. Lastly, a surplus skilled labor force needing jobs that can start quickly on building those 7GW approved projects and 8GW planned projects, that are ready to go now not in 10 years time. KIEV, March 17 (Reuters) - Russian gas transit to Europe via Ukraine fell 43.4 percent in February to 6.4 billion cubic metres from 11.3 bcm in February 2008 due to low demand, Ukraine's fuel and energy ministry said on Tuesday. The ministry said gas transit totalled 11.1 bcm in the first two months of this year against 23.7 bcm in the same period in 2008. "Europe is no longer taking Russian gas as it was before," Inna Koval, spokeswoman for Ukraine's gas transit monopoly Ukrtransgas, said. • Gazprom output continues to fall in March 09, Kommersant reported today. Gazprom’s daily natural gas output was 1,237 mmcm on March 15, 25% below last year daily output. Novatek's output stabilized at 87 mmcm daily, 6.5% below early March 09, but still 4.8% above last year March average. We note, however, that we estimate Novatek is producing at least 14% below its current capacity. • Domestic demand appears weak, export storage refilling is yet to materialize. We expected a further deterioration in output numbers from Gazprom, pointing at abnormally high demand last year and additional headwinds from economic slowdown this year. We expect domestic gas demand to run at least 20% below last year levels throughout March-May 09. Gazprom’s expectation of export sales pickup on the back of storage refilling is yet to materialize, and might be delayed until later this year, in out view. Just an observation, the local gas storage tank, dating back from the days of town gas, has been relatively high this winter, but on Thursday/Friday last week dropped to the lowest I have ever seen it. As of today the top is now hidden behind the lower ring. Considering when extended to capacity the top is around 100-120 feet it is one notable contraction to loose over 50% of height and capacity.